Transform limp, lack-lustre locks with the Total Results High Amplify Shampoo, Conditioner and Foam Volumizer from Matrix Biolage. Working to cleanse, condition and hold your style in place, hair, the trio work in tandem to create definition and plump skinny strands for ultimate volume. E.N. 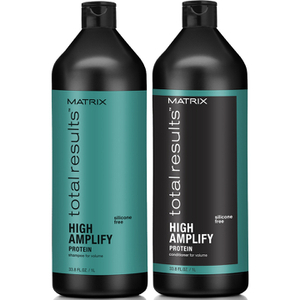 Add body and bounce to lifeless locks with the amplifying shampoo. Fortified with Full Boost Technology™, the weightless formula lifts hair for a long-lasting voluminous finish, whilst gently cleansing to eliminate excess oil and impurities. 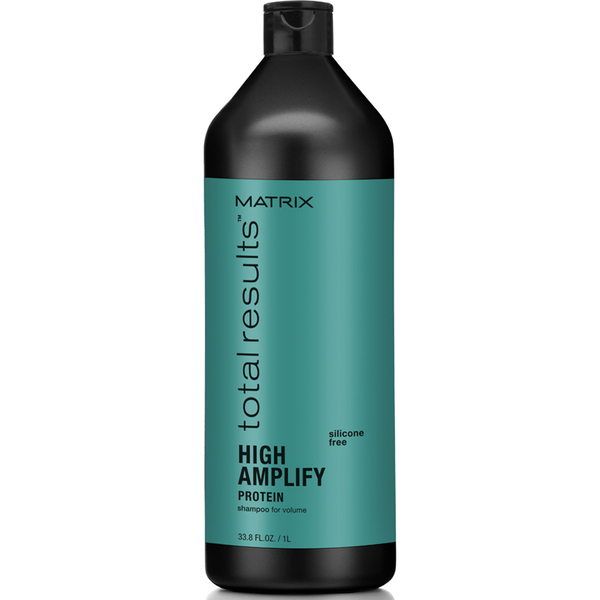 A dose of protein strengthens strands from root to tip so you can experience a thicker, fuller appearance. A body-boosting formula that works to add volume to any style without added weight. 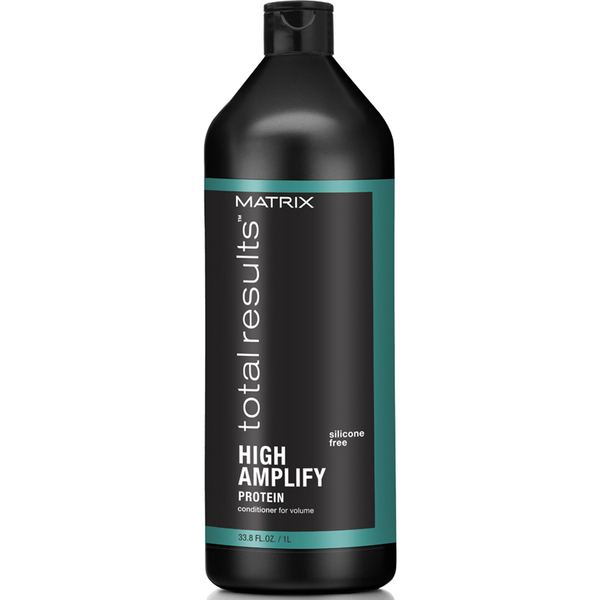 Ideal for fine, flat hair, a powerful cocktail of protein and panthenol strengthens and nourishes strands, whilst effortlessly detangling and fighting frizz and static. Experience luscious locks with enhanced shine, long-lasting bounce and va va voom! A plumping mousse to uplift and energise roots, leaving fine hair voluminous and bursting with radiance. Its lightweight yet powerful formula is infused with styling polymers for long-lasting hold, whilst adding thickness and extra 'oomph' to your locks. Experience hair that is flexible with added body, bounce and shine. Shampoo: Apply to damp hair, lather and rinse. Conditioner: Apply to wet hair after shampooing, then rinse. Mousse: Distribute evenly throughout towel-dried hair. Style as desired. Shampoo: Aqua/Water, Sodium Laureth Sulfate, Citric Acid, Cocamidopropyl Betaine, Glycerin, Sodium Hydroxide, Sodium Chloride, Hexylene Glycol, Parfum/Fragrance, Sodium Benzoate, Salicylic Acid, Polyquaternium-10, Panthenol, Limonene, Hexyl Cinnamal, Alpha-Isomethyl Ionone, Benzyl Alcohol, Hydroxypropyltrimonium Hydrolyzed Wheat Protein, Benzyl Salicylate, Linalool, Benzyl Benzoate, Citronellol, Ci 42053/Green 3, Ci 19140/Yellow 5. Conditioner: Aqua/Water, Cetearyl Alcohol, Behentrimonium Chloride, Starch Acetate, Cetyl Esters, Phenoxyethanol, Parfum/Fragrance, Isopropyl Alcohol, Hydroxyethylcellulose, Panthenol, Chlorhexidine Digluconate, Hydroxypropyltrimonium Hydrolyzed Wheat Protein, Limonene, Hexyl Cinnamal, Alpha-Isomethyl Ionone, Benzyl Alcohol, Benzyl Salicylate, Linalool, Benzyl Benzoate, Citronellol, Ci 42053/Green 3, Ci 19140/Yellow 5. Foam Volumizer: Aqua/Water, Isobutane, Propylene Glycol, Vp/Acrylates/Lauryl Methacrylate Copolymer, Amp-Acrylates/Allyl Methacrylate Copolymer, Propane, Peg-40 Hydrogenated Castor Oil, Phenoxyethanol, Parfum/Fragrance, Aminomethyl Propanol, Amodimethicone, Methylparaben, Oleth-10, Disodium Cocoamphodipropionate, Trideceth-12, Hexyl Cinnamal, Linalool, Alpha-Isomethyl Ionone, Limonene, Octylacrylamide/Acrylates/Butylaminoethyl Methacrylate, Copolymer, Citronellol, Cetrimonium Chloride, Benzyl Alcohol, Lecithin, Phosphoric Acid, Polyquaternium-10, Ethylparaben, Disodium Edta.